Check out Big Sean starring in the Adidas Original Trailer! Check out Big Sean’s feature in September’s Sister 2 Sister. G.O.O.D. Music is now an official label under Def Jam, which means that Big Sean will be the first G.O.O.D. Music signee to release an album after this agreement! Although Kanye West and his G.O.O.D. Music imprint has spawned the careers of Big Sean, Kid Cudi and Cyhi Da Prince along with the signing of Common and John Legend, the label never had an official home – until now. Kanye can now count his label as part of the Island Def Jam family after inking a worldwide label agreement deal that will feature protégé Big Sean as the first artist to benefit from the new partnership. The announcement came this morning from Kanye West, Universal Motown Republic Group and Island Def Jam Music Group Chairman & CEO Barry Weiss, and President & COO of Island Def Jam Music Group Steve Bartels. Big Sean will be the first G.O.O.D. Music signee to have a project released via the label agreement, with his debut album Finally Famous seeing release tomorrow (June 28). 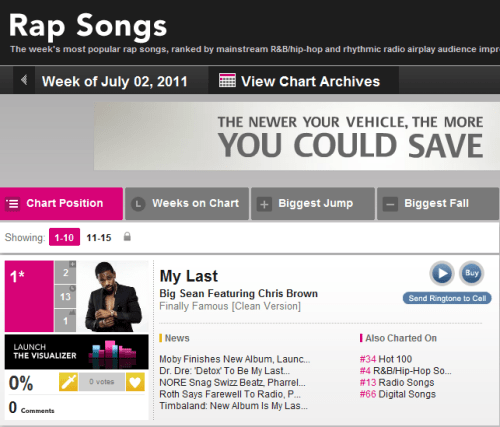 Congrats to Big Sean for “My Last” being the number 1 rap song in the country right now! Finally Famous dropping in 5 days! Pre-order your copy HERE.